Since the early twentieth century, Silicon Valley has been home to a vibrant, growing electronics industry. The industry began through experimentation and innovation in the fields of radio, television, and military electronics. Stanford University, its affiliates, and graduates have played a major role in the evolution of this area. A powerful sense of regional solidarity accompanied the rise of Silicon Valley. From the 1890s, Stanford University's leaders saw its mission as service to the West and shaped the school accordingly. At the same time, the perceived exploitation of the West at the hands of eastern interests fueled booster-like attempts to build self-sufficient indigenous local industry. Thus, regionalism helped align Stanford's interests with those of the area's high-tech firms for the first fifty years of Silicon Valley's development. During the 1940s and 1950s, Frederick Terman, as Stanford's dean of engineering and provost, encouraged faculty and graduates to start their own companies. He is credited with nurturing Hewlett-Packard, Varian Associates, and other high-tech firms, until what would become Silicon Valley grew up around the Stanford campus. Terman is often called "the father of Silicon Valley." During 1955-85, solid state technology research and development at Stanford University followed three waves of industrial innovation made possible by support from private corporations, mainly Bell Telephone Laboratories, Shockley Semiconductor, Fairchild Semiconductor, and Xerox PARC. 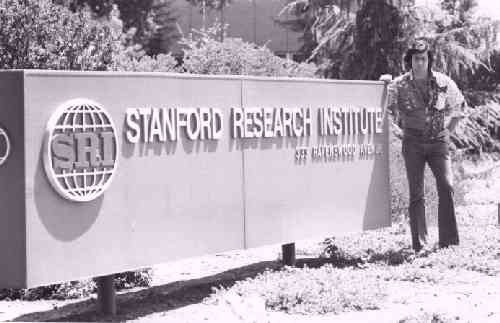 In 1969 the Stanford Research Institute operated one of the four original nodes that comprised ARPANET, predecessor to the Internet. It was in Silicon Valley that the silicon-based integrated circuit, the microprocessor, the microcomputer, among other key technologies, were developed, and has been the site of electronic innovation for over four decades, sustained by about a quarter of a million information technology workers. 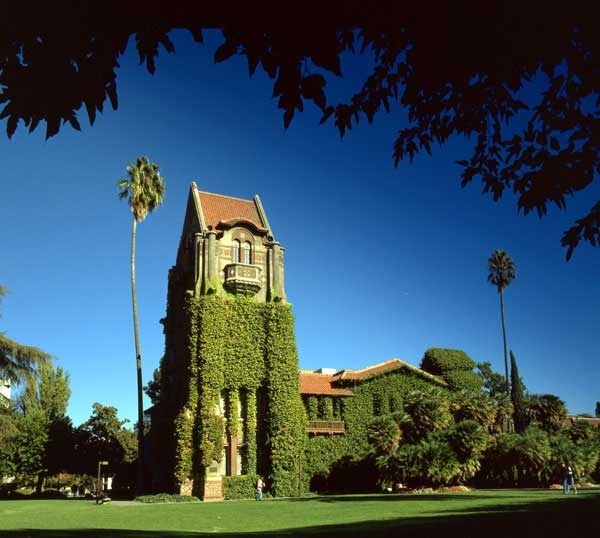 Silicon Valley was formed as a milieu of innovations by the convergence on one site of new technological knowledge; a large pool of skilled engineers and scientists from major universities in the area; generous funding from an assured market with the Defense Department; the development of an efficient network of venture capital firms; and, in the very early stage, the institutional leadership of Stanford University. The San Francisco Bay Area had long been a major site of U.S. Navy research and technology. In 1909, Charles Herrold started the first radio station in the United States with regularly scheduled programming in San Jose. Later that year, Stanford University graduate Cyril Elwell purchased the U.S. patents for Poulsen arc radio transmission technology and founded the Federal Telegraph Corporation (FTC) in Palo Alto. Over the next decade, the FTC created the world's first global radio communication system, and signed a contract with the U.S. Navy in 1912. 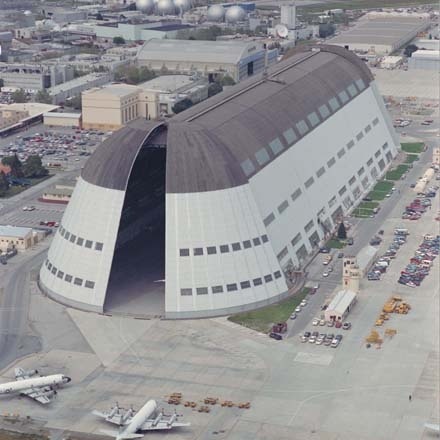 In 1933, Air Base Sunnyvale, California, was commissioned by the United States Government for use as a Naval Air Station (NAS) to house the airship USS Macon inHangar One. The station was renamed NAS Moffett Field, and between 1933 and 1947, US Navy blimps were based here. A number of technology firms set up shop in the area around Moffett to serve the Navy. When the Navy gave up its airship ambitions and moved most of its West Coast operations to San Diego, NACA (the National Advisory Committee for Aeronautics, forerunner of NASA) took over portions of Moffett for aeronautics research. Many of the original companies stayed, while new ones moved in. 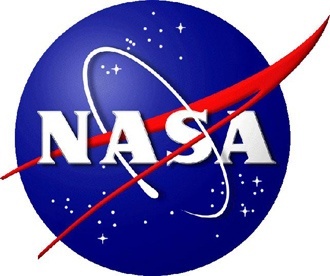 The immediate area was soon filled with aerospace firms such as Lockheed. After World War II, universities were experiencing enormos demand due to returning students. To address the financial demands of Stanford's growth requirements, and to provide local employment opportunities for graduating students, Frederick Terman proposed the leasing of Stanford's lands for use as an office park, named the Stanford Industrial Park (later Stanford Research Park). Leases were limited to high technology companies. Its first tenant was Varian Associates, founded by Stanford alumni in the 1930s to build military radar components. However, Terman also found venture capital for civilian technology start-ups . One of the major success stories was Hewlett-Packard. Founded in Packard's garage by Stanford graduates William Hewlett and David Packard, Hewlett-Packard moved its offices into the Stanford Research Park slightly after 1953. In 1954, Stanford created the Honors Cooperative Program to allow full-time employees of the companies to pursue graduate degrees from the University on a part-time basis. The initial companies signed five-year agreements in which they would pay double the tuition for each student in order to cover the costs. Hewlett-Packard has become the largest personal computer manufacturer in the world, and transformed the home printing market when it released the first ink jet printer in 1984. In addition, the tenancy of Eastman Kodak and General Electric made Stanford Industrial Park a center of technology in the mid-1990s. In 1953, William Shockley left Bell Labs in a disagreement over the handling of the invention of the transistor. After returning to California Institute of Technology for a short while, Shockley moved to Mountain View, California in 1956, and founded Shockley Semiconductor Laboratory. Unlike many other researchers who used germaniumas the semiconductor material, Shockley believed that silicon was the better material for making transistors. Shockley intended to replace the current transistor with a new three-element design (today known as the Shockley diode), but the design was considerably more difficult to build than the "simple" transistor. In 1957, Shockley decided to end research on the silicon transistor. As a result, eight engineers left the company to form Fairchild Semiconductor. Two of the original employees of Fairchild Semiconductor, Robert Noyce and Gordon Moore, would go on to found Intel. By the early 1970s there were many semiconductor companies in the area, computer firms using their devices, and programming and service companies serving both. Industrial space was plentiful and housing was still inexpensive. The growth was fueled by the emergence of the venture capital industry on Sand Hill Road, beginning withKleiner Perkins in 1972; the availability of venture capital exploded after the successful $1.3 billion IPO of Apple Computer in December 1980. Although semiconductors are still a major component of the area's economy, Silicon Valley has been most famous in recent years for innovations in software and Internetservices. Silicon Valley has significantly influenced computer operating systems, software, and user interfaces. Although Stanford University provides the historical basis for high-technology growth in the South Bay, and remains at the center of high-technology academic research in Silicon Valley, San Jose State University has emerged as the largest supplier of working engineers to high-technology companies in the region. In this light, SJSU engineering, business and computer science graduates often are viewed as the workhorses that power Silicon Valley from day to day. Former SJSU students and SJSU alumni also have founded or co-founded a number of important high-technology firms, many of which were integral to the commercial growth and development of the region. Included among those companies founded or co-founded by former SJSU students and SJSU alumni are Intel Corporation, Oracle Corporation, Quantum Corporation, Seagate Technology, and Atmel Corporation. 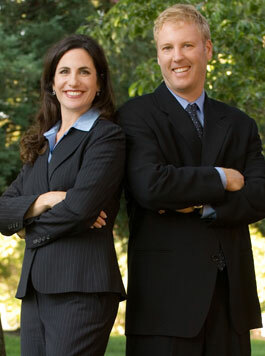 SJSU alumni also have risen to the level of CEO and/or senior vice president at numerous high-technology firms in the region including ROLM Corporation, Cisco Systems, IBM, Google and Solectron Corporation.Additionally, Ray Dolby and Charles Ginsburg are two Silicon Valley luminaries with close ties to San Jose State. Even after the dot-com bomb, Silicon Valley continues to maintain its status as one of the top research and development centers in the world. A 2006 Wall Street Journal article found that 13 of the 20 most inventive towns in America were in California, and 10 of those were in Silicon Valley. San Jose led the list with 3,867 utility patents filed in 2005, and number two was Sunnyvale, at 1,881 utility patents. Silicon Valley is an area that is "located on the San Francisco, California, peninsula, radiates outward from Stanford University. It is contained by the San Francisco Bay on the east, the Santa Cruz Mountains on the west, and the Coast Range to the southeast. 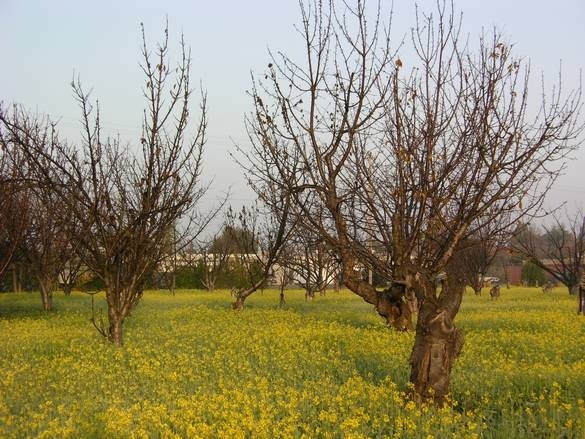 At the turn of the century, when fruit orchards predominated, the area was known as the Valley of Heart's Delight "
WHAT'S NEXT FOR SILICON VALLEY? California History Center. California history and studies are the focus of the California History Center's Stocklmeir Library and Archives. 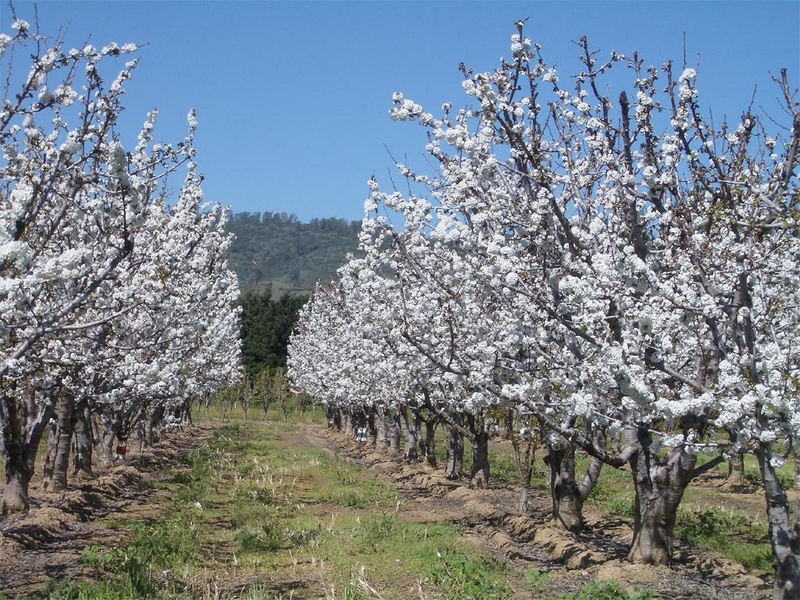 Published and archival materials are collected with special emphasis on Santa Clara Valley agriculture and on the state's political, economic, cultural and social history. History San José Research Library. The History San José Research Library collection documents Santa Clara Valley history. The collection is comprised of donated records and papers from private individuals, businesses and organizations. Collected materials include photographs, manuscripts, maps, ephemera, selected City of San José and Santa Clara County historical records and published works. Mountain View Public Library History Center. The mission of the History Center is to collect, organize and make available Mountain View historical resources and to promote the city's heritage. The History Center collects, organizes, stores and displays books, maps, pictures, manuscripts, audio visual materials and other printed, handwritten and drawn artifacts pertaining to Mountain View's heritage. Due to the importance of this unique collection, appropriate preservation methods and materials are sought out and utilized. The collection is limited to those materials which deal directly with Mountain View. Since historically the Mountain View community included present day Los Altos and Los Altos Hills, the collection also encompasses the historical aspects of those communities. Materials broader in scope than Mountain View (e.g., Santa Clara County) which include Mountain View as a significant part or which contain unique information about the city are also collected. Santa Clara History Center. The mission of the City Library's Santa Clara History Center is to collect, preserve, organize, and make available to the public Santa Clara City historical materials for the purposes of providing the community with local history research opportunities and fostering civic pride by sharing the City's colorful heritage. The Santa Clara History Center collects, preserves, organizes, stores and displays books, maps, photographs, newspaper clippings, pamphlets, oral histories, audio-visual materials and photocopies of original documents pertaining to a wide variety of subjects related to Santa Clara history. Santa Clara University Archives. The Santa Clara University Archives collects, preserves and provides access to records of Mission Santa Clara and Santa Clara University. These materials document the rich religious and educational heritage of the Mission founded in 1777 and the University established as Santa Clara College in 1851. San Jose State University Special Collections. The mission of Special Collections is to develop quality research collections in local, regional, and California history. Included are the University Archives, containing photographs, ephemera, and artifacts dealing with the University's rich history as the oldest public institution of higher learning in California. Special Collections also houses the Legislators Archives, containing the legislative papers of Norman Mineta, Don Edwards, Alfred Alquist, Rod Diridon Sr., and Dianne McKenna. Photographic collections include the John C. Gordon Collection, consisting of over 10,000 photographs of San Jose and the Santa Clara Valley from the early-mid twentieth century, and the Ted Sahl Archives, a collection of over 6,000 photos and ephemera detailing local gay and lesbian history from 1976 through 2001. Photographs may be copied and displayed for a fee. Sourisseau Academy. The mission of the Academy is to promote local history through sponsoring research, educational programs, and publication. The Academy awards several small grants each semester to further scholarly research by graduate students and individuals in the historical community. We are actively engaged in the rescue of endangered archival documents and act as a clearing house for the placement of archival collections in appropriate repositories. The Academy maintains a small archives of documents and historical photographs. We also provide a variety of outreach services. Stanford and Silicon Valley Archives Project. The Stanford University Libraries have since 1983 preserved and provided access to archival materials on the history of Silicon Valley through the Stanford and Silicon Valley Archives Project. This project seeks to identify, preserve, and make available the documentary record of science, technology, and related business and cultural activities in Silicon Valley.